Expert Fire Solutions are proud to announce that following an assessment by a UKAS accredited organisation, ISOQAR, they have been successful in achieving ISO 9001: 2008 certification, an internationally recognised standard for developing and maintaining quality management systems. The certification recognises that policies and procedures comply with the high standards required by ISO 9001 and further demonstrates commitment to customer satisfaction. With only around 8% of UK businesses holding this certificate, the business are now at the forefront of quality service and customer care. 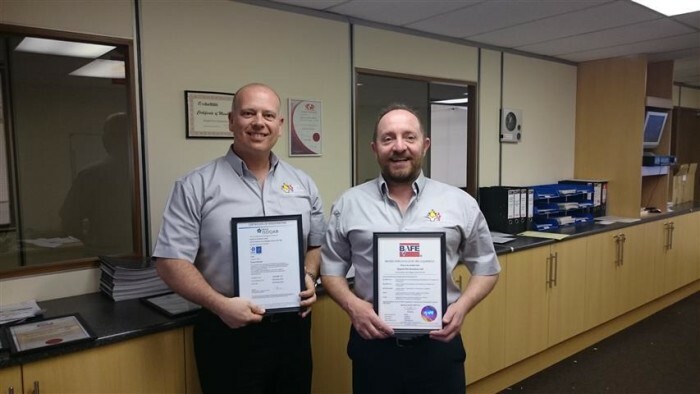 Expert Fire has also achieved BAFE accreditation, British Approvals for Fire Equipment, which is recognised as the Fire Protection Industries, main third party certification body (similar to Gas Safe for plumbing & heating engineers). The company also hold accreditations to CHAS, the Contractors Health & Safety Assessment Scheme and Constructionline. For your peace of mind, Expert Fire are offering DBC member’s a complimentary fire safety health check. A member of their friendly team will visit your premises to give members the help and advice they may need on meeting current fire safety regulations. We want you to be safe and compliant in the workplace. Call 0191 3750264.